Kerry Cave of Hennessy Automobile Cos.: "It was time to see what is available out there." 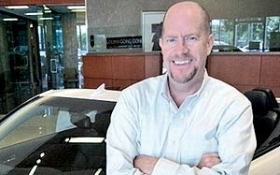 Kerry Cave, digital director of Hennessy Automobile Cos. in Atlanta, was quick to sign up the group's two Lexus stores for a new Web site provider made available by Lexus. Cave said he has had good success using VinSolutions in the past for customer-retention software so he wanted to give the vendor a chance at hosting the two stores' Web sites. Lexus' second Web-site provider, being tested at about 10 stores in a pilot, is part of a trend. Several automakers are heeding their dealers' desire for more choice in online vendors. Lexus, Cave said, deserves credit for listening to its dealers and presenting a choice for a critical store application dominated at the brand for years by vendor Cobalt. The pilot, he said, is running until October and includes Hennessy Lexus of Atlanta and Hennessy Lexus of Gwinnett in Duluth. "It was time to see what is available out there," said Cave, who directs digital strategy for 11 stores in the Hennessy group; brands include Land Rover, Jaguar, Porsche, Rolls-Royce, Mazda, Buick and GMC. Lexus confirmed the pilot but declined to give details. Other automakers are making more vendors available. In the first quarter, Chrysler Group certified four more vendors to a paid-search co-op program that allows dealers to be reimbursed for search engine advertising on Google and other sites. The additional vendors joined the three originals in the year-old program. Chrysler said it may add others this summer. When General Motors this year required its dealers to have a reputation-management vendor monitor customer reviews, it gave the dealers three choices of vendors. Lexus dealers today predominantly use Cobalt, a unit of ADP Dealer Services, as their Web site provider. A Cobalt spokesman declined to comment on Lexus' pilot with VinSolutions. Cave said he's optimistic about early results from the pilot with VinSolutions. In June, the first full month since he switched to VinSolutions from Cobalt, the Lexus store in Atlanta had a 14 percent increase in Web site traffic, and there was an 11 percent lift at the Gwinnett store, he said. He attributes part of the increase to the intuitive layout of the sites and the ability of the stores to update content for shoppers conveniently. The bounce rate for Web site visitors, or the rate at which shoppers come to a site but don't open any page beyond the home page, has fallen to 21 percent from the mid-30s immediately before VinSolutions, Cave said. The longer a visitor stays on a site, the more likely he or she is to request to be contacted for more information or ask for a test drive, Cave said. Moreover, Google factors in Web site content and visitor length-of-stay when determining the position that a dealership gets on a search page for online shoppers. The effort to get good position is called search engine optimization. VinSolutions declined to comment. The company is a unit of the AutoTrader Group. Cave said time will tell whether Lexus wants to certify VinSolutions with other dealers. But at least the brand is keeping an open mind. Cave said: "It's good to see options."